'Love your work as much as you love your workout!' That's what the flyer on the wall of the gym said. I didn't need to read it twice; I tore it down and made the phone call as soon as I got home. I started lifting weights when I was 12 years old, using my Dad's old Hollywood Barbell weight set that we'd reclaimed from a dark corner of my grandfather's basement. I stayed with it through high school, and, by the time I reached Colby College, I knew more than most about how to change the body. It could be said that my 'personal training' career began at Colby; I spent a good deal of time fielding questions in the college weight room. By the time I graduated, I was looking for a way to turn my passion for sports and training into a career. A year after I graduated, I saw that flyer, and I was on my way. The Aerobics and Fitness Association of America provided my first formal fitness education - and my first professional certification. When I went to Chicago to visit family, I found myself looking into local fitness centers, and happened upon the facility that happened to be the official training center of the Chicago Bulls. Sold! 20 years brought many opportunities to learn more: professional credentials from ACE, NASM, NSCA, RTS, and IYCA, a mentorship at Athlete's Performance in Arizona, and professional youth coaching credentials from the NYSCA. 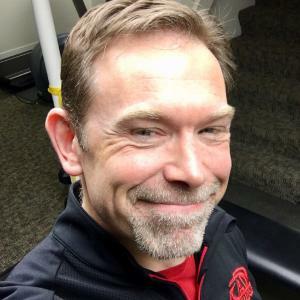 I've run the fitness programs and personal training departments for two of the largest fitness centers on Chicago's North Shore. Best of all, I've been able to coach all three of my kids sports teams for years. Today, I offer the best possible service and results to every individual. Being 'in shape' means something different to each person. Some want to be able to play with their kids without getting tired. Some want to be able to get out of bed in the morning without back pain. Some just want to fit in a smaller pair of pants. Whatever your goal, please allow me the opportunity to help you achieve it! ... read more.